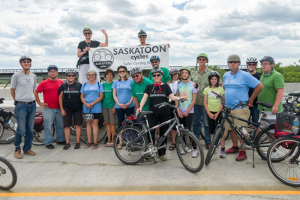 Saskatoon Cycles members are recreational, commuting, utility and sport cyclists, pedestrians and motorists – anyone who agrees Saskatoon would be a better place if we had better bikeways. Become a member by filling out the form below. One benefit of membership is our monthly email newsletter. All are welcome. You will be begin receiving e-mails from Saskatoon Cycles. Thank you for joining! Our Mission, Vision and Priorities are just to the left. Please review our Vision and make sure you agree. Become a member the old-school way! You can also become a member by downloading and completing the form in the Membership Brochure and mailing it to the address in the brochure. Or, you can drop it off at the Bike Valet or any other Saskatoon Cycles events. All are welcome. One benefit of membership is you receive our monthly email newsletter. Thank you for joining! Click the image below to download the Saskatoon Cycles Membership brochure.